I had sewing failures two in a roll, what a bummer!!! Dont ask me what I was smoking when I made this — preggers are not allowed to be high. Besides the ugly ruffling, which i could technically remove and replace with a double layer fabric, the whole thing just looks weird on me. The only sad thing is that its super duper comfortable, made from bamboo knit… I feel very sad about tossing it like that. 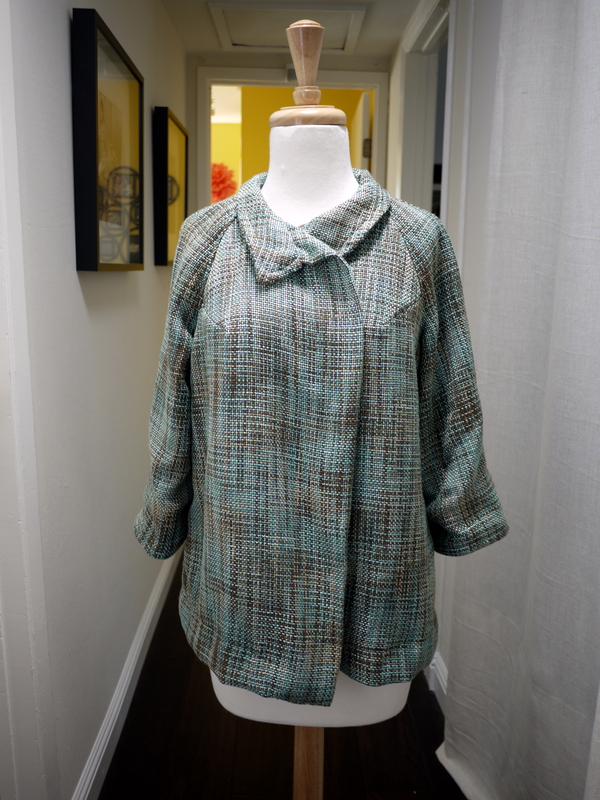 Burda 2010/03 spring coat. 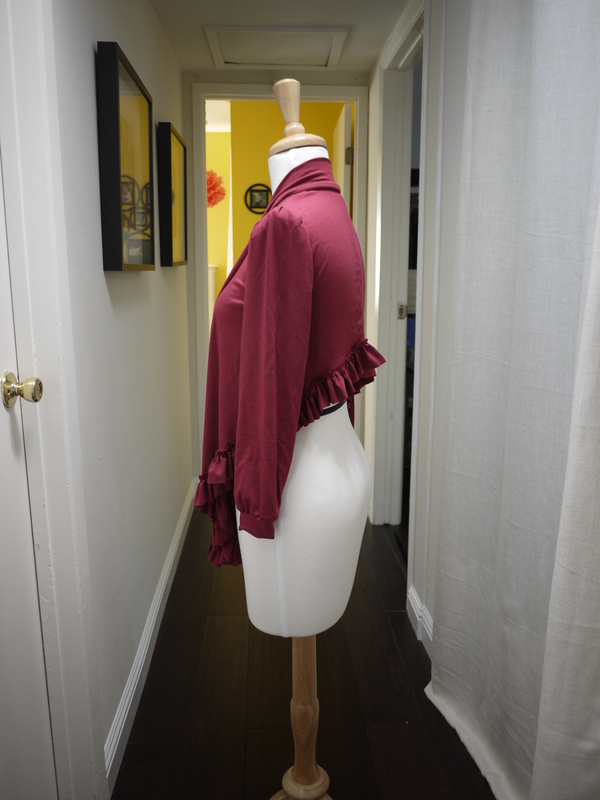 I had been wanting to make up a Raglan sleeved coat for a year now, since I dont have any in my closet. This pattern seemed pretty perfect for it. 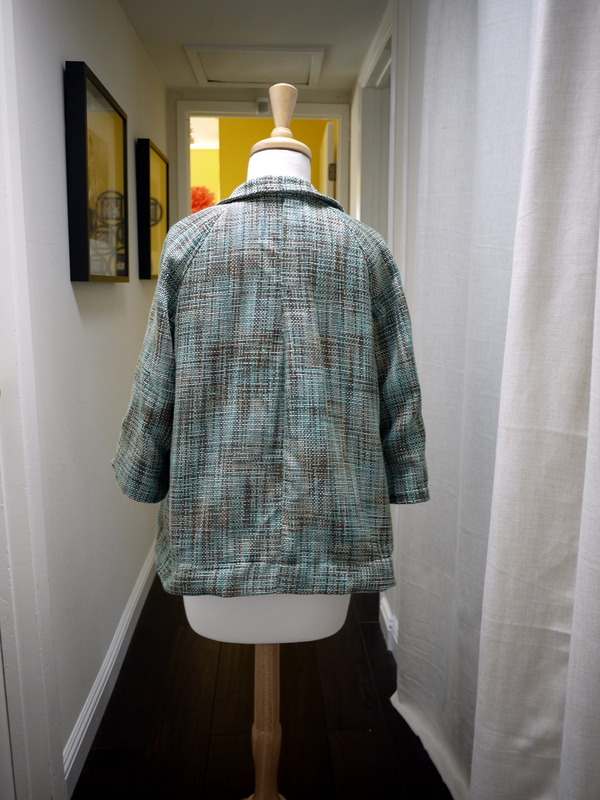 Unfortunately I had the mishap of choosing a polyester coating material, which seems pretty awesome since it was very soft and drapery, what I thought would work well with this kind of coat. However, it is a pain to sew as it slips around, and no matter how much I pressed it, it will not un-wrinkle >( The whole look is just very saggy. 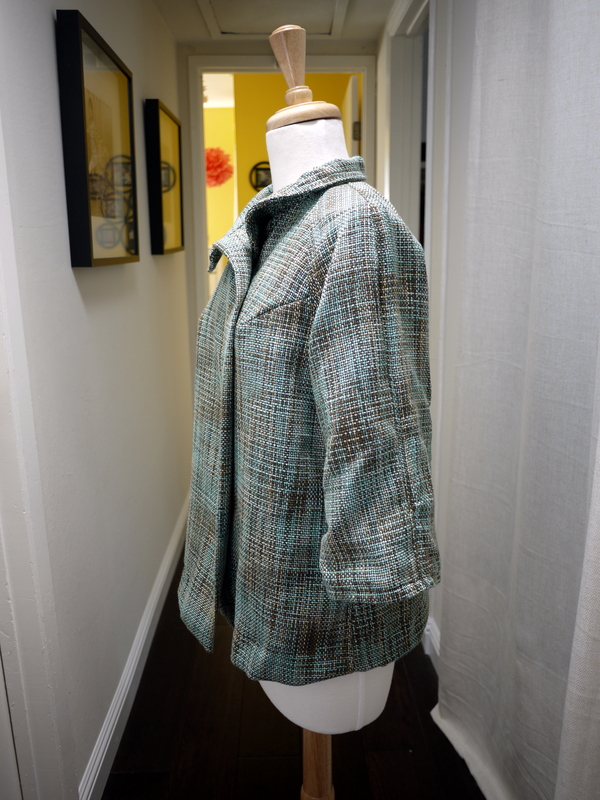 The pattern itself seems to fit fine, except that there’s a little too much overlap in the front, making it feel more like a peacoat front than a single button row front. Its a bummer as I had lined it nicely. So far the only thing I can find online is mustard wool from Mood for $18/yard. There’s shetland wool from fabric mart for 13/yard that comes in a varieties of colors, but shetland wool has a very loose weave, which is a little more light weight than i’d like for a coat or jacket. It also is slightly scratchy, which I dont think baby Kaylee would appreciate so much when I carry her around. Dont you wish there’s more fun wool out there? This entry was posted on Tuesday, September 20th, 2011 at 3:30 pm	and posted in finished pieces. You can follow any responses to this entry through the RSS 2.0 feed. That’s too bad, maybe you could salvage the fabric from the first one and make something for the baby? And I know what you mean about not being able to fine wool in cool colors, I haven’t had any luck either. Wait, why’re you calling the first one a failure? I probably am just not seeing it but it looks pretty perfect to me. I’m not a ‘ruffles’ girl so I don’t like them but otherwise, it looks great! Love the color! hahahaha, i have the feeling that its perfect to you cos its in maroon — totally your color! 😉 in dexter’s word, it looks like a dancing troop costume. please take it off my hand to relief my guilt! it would be good if someone can enjoy hours of labor! 😉 i’ll bring it this weekend! Hmm, think you can save the pink cardi. btw, I like your dressform, what brand is it? I’ve recently turned a few sewing mistakes (practically UFO’s from about 10 years ago) into a great skirt, so I’d say, save the fabric! I think sometimes it is hard to see how something that looks great in a magazine would look on yourself. 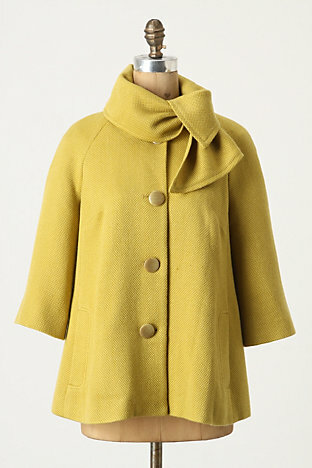 I still love the fabric of the coat! wow! you keep your UFOs for a long time! ill keep mine around for a little bit and see if i ever get in the mood to salvage it. for the coat material however, i dont know if id like to deal with it ever again! no more polyester for me! 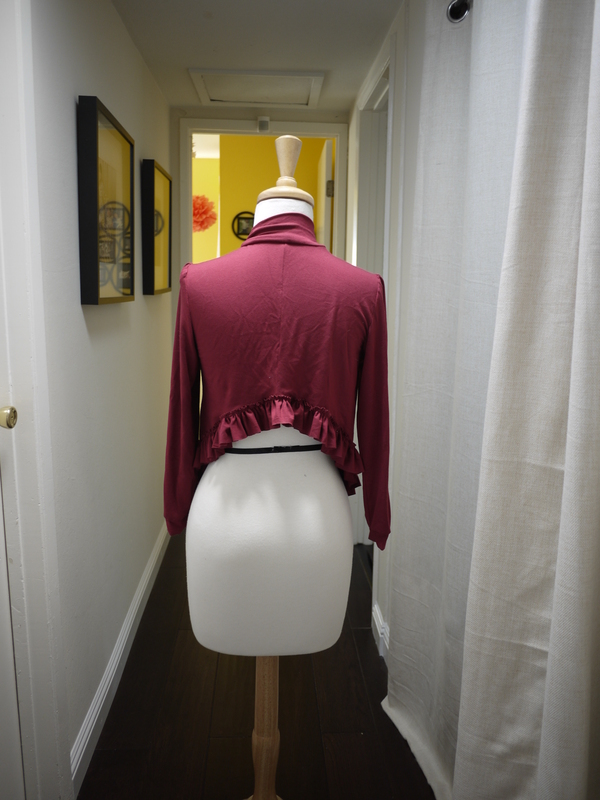 The cardi might suit you better once the baby is here, so don’t toss it yet! Or you could maybe recycle it into something else. Bummer on the jacket, and I know what you mean about not being able to find pretty coatings–I had an entire rant dedicated to that very thing not too long ago. *sigh* I think the biggest problem is that if the colors I want exist they cost way more than I’m willing to spend on them. hehe, yeah! i was thinking it would wrap the baby around myself as well… perhaps ill look for a real pattern. 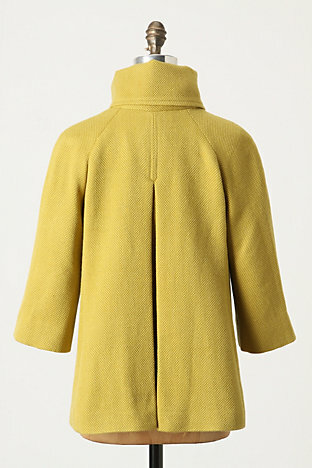 its amazing how designers can manage to find pretty wool and still sell their coats for pretty cheap. Dude, these are not failures, they all look great 🙂 Especially the bamboo knit one, if you put that in the mall tons of people would pay a lot to buy it.